On Thursday an investigation by Chrissy revealed the Beacon West shaft to be flooded to within a foot of the pipe. By Friday the water level in West had dropped approx 1ft but the top of the main dragway was still submerged. On Saturday levels had dropped a further 5ft or so and there was a similar drop by Sunday morning. It is encouraging to note that levels were still dropping even with significant flows entering the dig. Beacon East was back to normal at this time. Here are a few shots at the end of Beacon West taken 15/1/03. The dye tracing exercise commenced on 10 Feb 2003 with sampling commencing at various sites to establish background levels. Dye was put into Beacon Slocker East and Beacon Farm Slocker on 13 Feb with intensive sampling starting some hours later. Sampling continued for six weeks at a number of sites from St Aldhelms Well at Doulting in the East to St Andrews Well at Wells in the West. Although it cannot be considered conclusive due to the low readings, it is possible that a positive result was obtained toward the end of the test period. A further trace will be carried out as soon as practicable and other investigations are ongoing. Access to all caves in Harridge Wood Nature Reserve is controlled by the club on behalf of the Somerset Wildlife Trust. There are a number of club digs within the Reserve including Harridge Wood Hole, EMMC(A) and Upper Rising. During 2003 considerable work was carried out at Upper Rising which was completely dry for much of the summer and autumn. Primarily a tunnelling exercise following a narrow rift, the passage has been extended for approximately 10m initially following the watercourse, and beyond into a bedding plane as yet unentered. Work presently halted pending next dry spell. 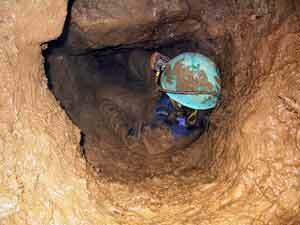 Digging started in 1999 with the enlargement of the entrance to facilitate entry by normal size cavers. 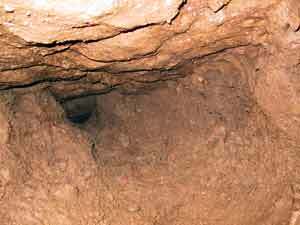 The cave was quickly extended by 10m reaching a point where the stream disappeared through a small narrow rift. Some chemical persuasion made this passable to a small chamber and passage adding a further 3m or so. Digging continued in mud choked passage making slow but positive progress. Work ceased whilst other sites were pursued but recommenced at the end of 2003. 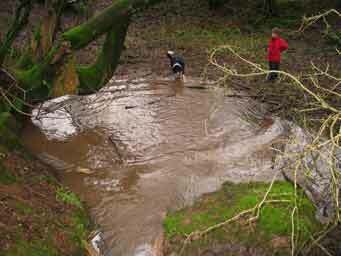 In 2006 another hole was opened in the same depression whilst a highway drain was being laid by Somerset Highways. A piped shaft was installed and the entrance gated. 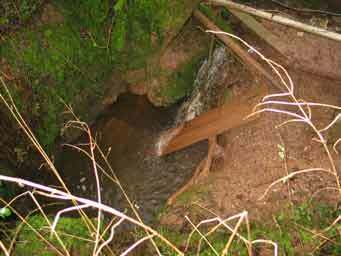 A passage can be seen continuing down dip and will be dug as soon as time is available. A gate was also installed on the main entrance at the same time. Both entrances are locked and keys are available from Larkshall. Originally explored and briefly dug by WCC in 1961, by ourselves (Pete, Nick & Graham) in 1972, and by others unknown in 1993, work has recommenced at this site at the beginning of 2004. Presently the cave has two ends, the wet way where the stream disappears along a small passage which gradually decreases in size and would make a decidedly unpleasant digging prospect, and the dry way which ends in a narrow impenetrable rift beyond which can be heard flowing water. The obvious choice is currently being pursued with the aid of some chemical persuasion. Keys are normally available from Larkshall but the caves are temporarily closed (January 2013) whilst a new access arrangement is negotiated. Not currently being dug due to other commitments but not abandoned. Good location being nearest cave to hut and awaiting renewed interest. The main project at the moment. Much work has been undertaken since Oct 06 and there are so many leads that there is not the manpower or time to pursue them all. All very exciting. Much effort is concentrated here often with two trips per week. 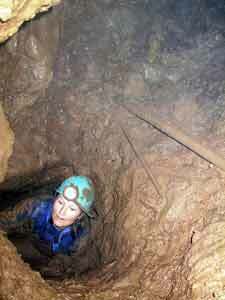 Since starting digging we have increased the length of the cave to over 1200ft. In Oakhill. Exact location is not publicised due to sensitive position of entrance. Open passage entered after only a few days digging. Streamway found later and work continues. Very interesting site. Currently our only dig on central Mendip. Steady progress being made in huge boulder filled rift. The rocks yield nicely to some chemical persuasion. Main problem is it is a long way to carry cement, not to mention finding the time when Withybrook continues to go so well. Anyway pleasant diversion combined with nice trip. Work continues. Work continues as time available. Main rift has reached floor but route continues down clay filled bedding. Higher level clay filled phreatic passage goes down dip to short vertical drop leading to rift with standing water in wet weather. Very pleasant on a sunny afternoon.